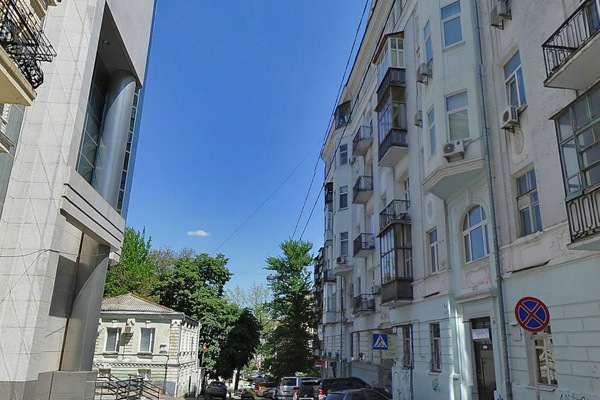 Mykhailivskyi lane is a tiny narrow street runningamong old historic blocks of Kiev with low-rise buildings of the nineteenth century in immediate vicinity of Kreshchatyk and Maydan (main square of Kiev lays in 3 minutes walk). It is also in close proximity from the most prominent Kiev's sightseeing places and monuments: Volodymyrska Hirka park, Sofiivska church and Mykhailivskyi monastery. Nearest Metro stations - Maydan Nezalezhnost and Zoloti Vorota. Accommodation in this area is the most desirable if you want to be in the centre of all city life: entertainment, strolling, transport routs are nearby as well as shopping malls and eateries of different cuisines. Right in front of the building there is a nice art-cafe, in 2-3 minutes walking a lot of restaurants and pubs are located. That is why Kiev's most fashionable hotels - Hyatt Regency and Intercontinental have taken a fancy to this place. 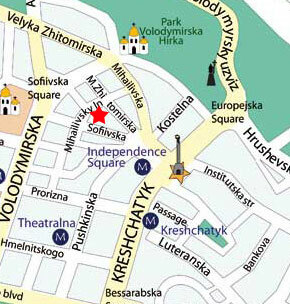 The first one is situated right across the street from our apartment on 9a Mykhailivskyi lane. 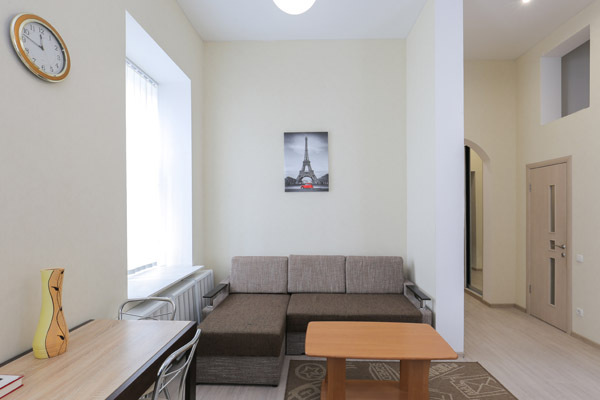 Newly renovated one-bedroom accommodation on Kreshchatyk street near Metro. Nice and quiet one bedroom apartment near Maydan. This accommodation is located on the second floor of historical empire style building of 19th century. The building has secure entrance and elevator. Worth a mention that our office is located here as well but on the ground floor. The same staircase is occupied with other our apartments (one-room). 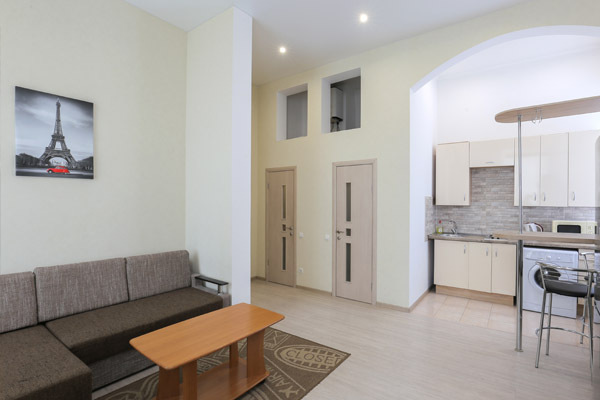 Apartment is renovated in modern European style, comes with comfortable furniture and all necessary domestic techniques and appliances. Tall ceilings up to 4.2 meters in height, light walls and huge windows create spacious, airy andtranquil atmosphere. Floors are covered with quality laminate and carpets. Each room has air conditioning. Bedroom is a bit smaller but elegant and attractive also. Living-room is combined with kitchen area creating a significant piece of living space. Big wardrobes and chest of drawers are for your comfort too. 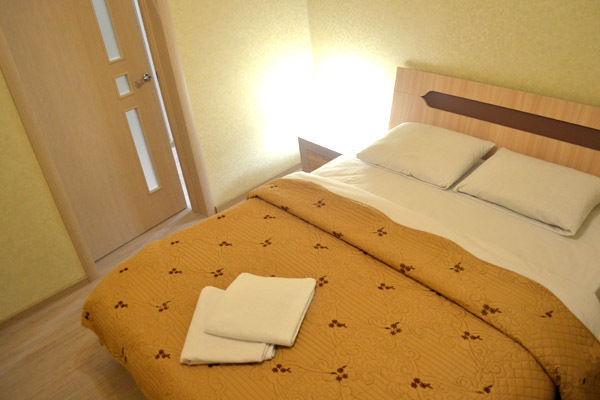 Bedroom is well-designed and equipped with jacuzzi and shover, washing machine and electric water heater. Also this apartment has refurbished and glazed balcony with outdoor furniture intended for smokers. Free and unlimited broadband Internet with WiFi, TVset with more than a hundred cable channels in different languages will keep your connection to the world. 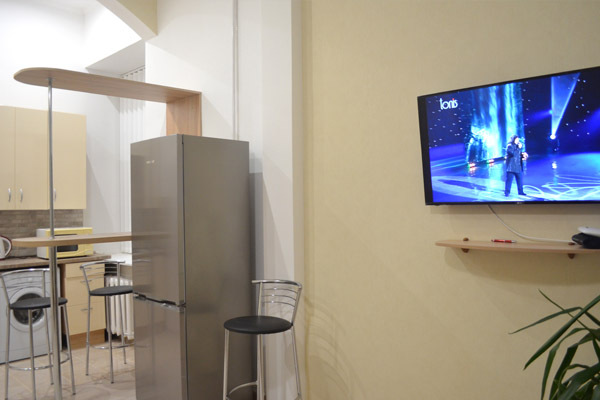 This apartment is perfect choice for tourists and all guests coming to Kiev due to its nice location, renovation and reasonable price. Hyatt Regency hotel holds 4-5 times higher rates for equal suite.